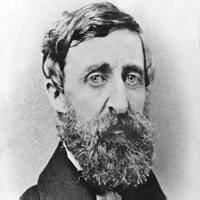 If Henry David Thoreau were alive today you might think he was a little odd or you might admire him. Born on July 12, 1817, in Concord, Massachusetts, Thoreau was a philosopher, naturalist, and writer who believed in living simply. In 1845 he put that belief to the test and moved to a hut on the edge of Walden Pond near Concord. For two years he lived with a minimum of possessions and limited his contact with people. What would you do for two years in a little hut away from people?